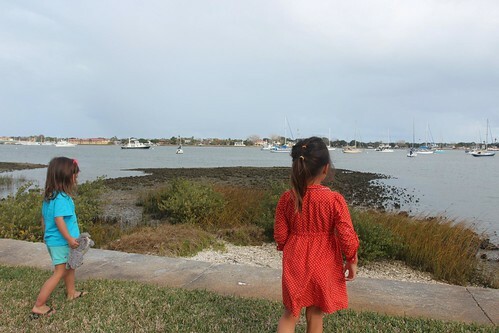 Mali Mish - Day 122: Boats and Forts in Saint Augustine. 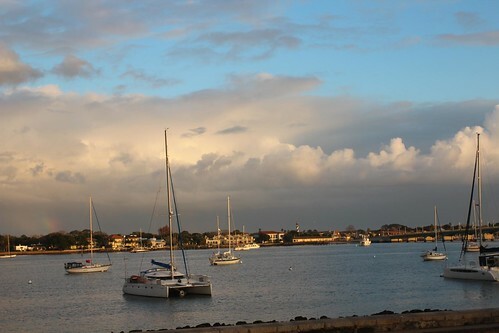 Day 122: Boats and Forts in Saint Augustine. So you know how we are trying to stay on “California time” on this trip? Well, this little guy has other plans. He likes the Eastern time zone just fine and has been waking up around 6:45 am. Maybe he heard all the other campers talking crap about the lazy Californians who barley make it out of the campground by 11am on a good day. You can’t call us lazy anymore!! 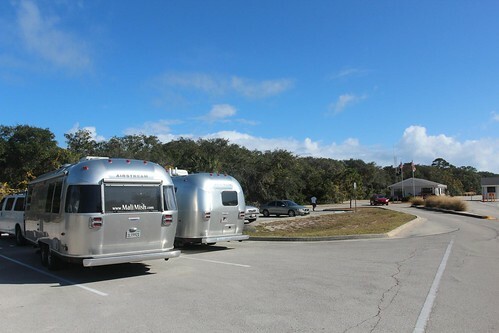 Today we were leaving the Huguenot County Park in Jacksonville and heading to Saint Augustine for the night. We also said farewell to Casey and his daughter Makay. 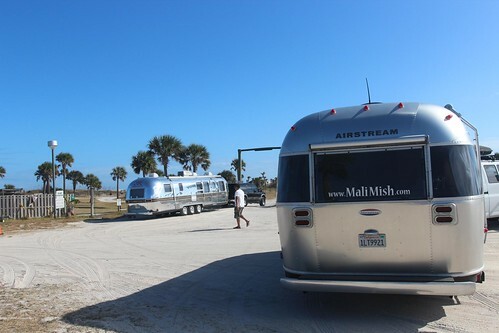 It is so great to meet up with virtual Airstream friends and actually become real friends. With the love of Airstreams and travel in common, it is so nice to not have to spend time explaining why in the world we do this and just spend time chatting and eating s’mores. 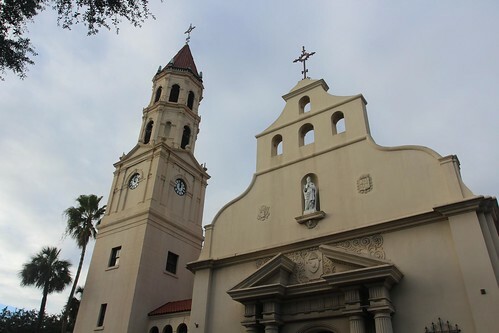 The last time we were in Saint Augustine we tried to get a spot at Anastasia State Park but the rangers said they had terrible cell reception so we took off and just boondocked at a Flying J outside of town. Two and a half years later, we are back and the cell coverage is supposed to be better so we reserved a last minute spot that they thankfully had open. 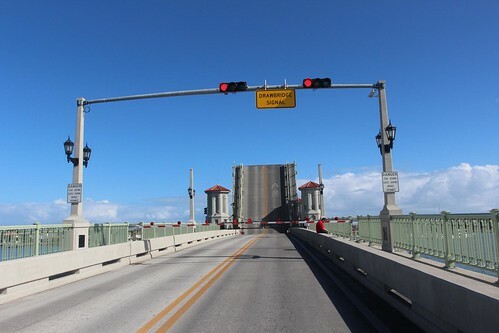 The park is about a mile from the oldest part of town, just over this drawbridge. The entrance of the park is surprisingly tight. As we were about to enter the park, I mention to Dan that it looked real tight. He shook his head because he loves when I exaggerate. But after we pulled in, he even commented about the placement of the pole divider they had cemented in the street. Who’s exaggerating now? This is going to be the last stop of our carvanning adventure with Kyle. We are heading off to Orlando tomorrow and he’s staying here for a bit longer to enjoy this old beautiful town. Check out our spot. No need to worry about our neighbor’s peeking at us thru our windows. It’s a jungle, baby!!! And the cell reception wasn’t too bad. Fast enough to get some work done… but not fast enough to catch up on my General Hospital. Boo hoo. We somehow managed to find decent parking in town in a parking lot that we were probably not supposed to be parked in but it was Sunday and everyone else was doing it, okay! We ended up grabbing a bite to eat at the first restaurant we saw called OC Whites. 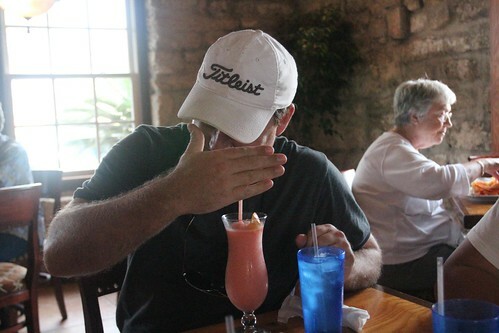 Our food was decent but someone else really enjoyed their Rooty Tooty Fresh and Fruity smoothie. But I am not naming names. How long have we’ve been caravanning with Kyle now? Well, it is how long he and Dan have been scheming to sail the seas while we are in Florida. Every day is boat talk, we all want to visit an Intrepid Powerboats location and get ourselves in the water. And I am almost all out of eye rolls. So the men decided that today was their day they were going to check out some boats at the marina. 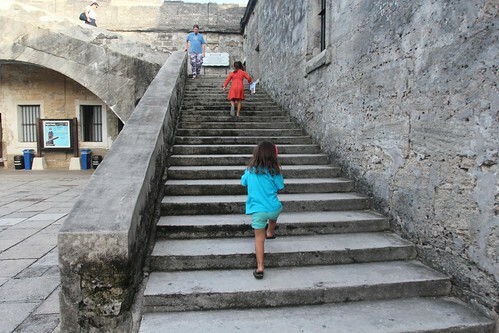 The kids and I were going to be on our own to explore the city of Saint Augustine. 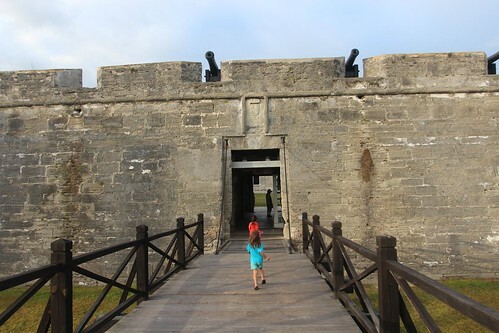 We walked around the touristy part of town, grabbed some ice cream at Kilwin’s and decided that the fort would be a better place for us to stretch our legs. 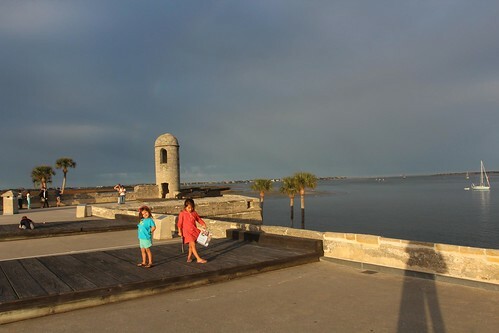 Castillo de San Marcos is a national monument so we got to get in for free with our National Park Pass. This is one of the places that we stopped at during our cross country adventure in 2010 but the girls don’t remember actually being here so it is a new adventure for them. 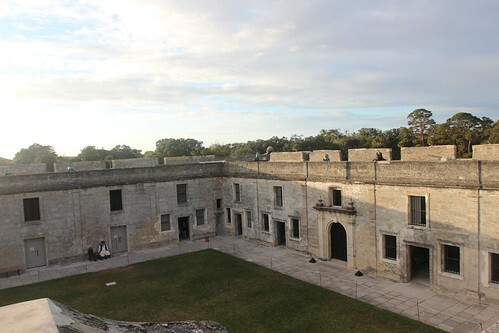 We were on top of the fort at sunset and the views from up there are amazing. We waved at Dan and Kyle on their new sailboats they just purchased minutes ago. Haha. They wish. The weather has been tolerable here in Florida so far. So much so that I did not pack any sweaters for the kids. Big mistake. It does still get a little chilly outside once the sun starts to set. 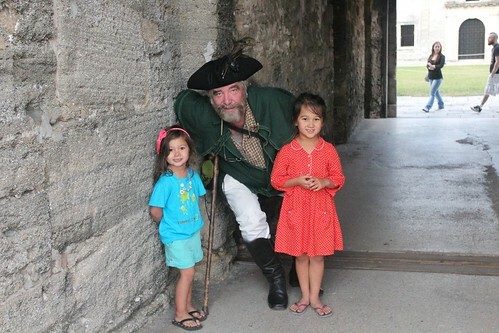 So we rushed thru the fort and the girls actually got to complete another Junior Ranger program and received a badge from this guy. The girls kept asking me if he was a good pirate. 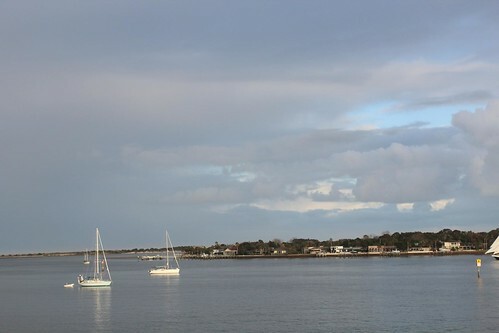 The sun was getting lower and lower and the boaters were still doing their thing. So we headed towards the marina in hopes that they were done shopping for boats and that they didn’t trade the Airstreams in for collateral. I have a feeling Yoda the cat might get a little sea sick. And guess where they were? 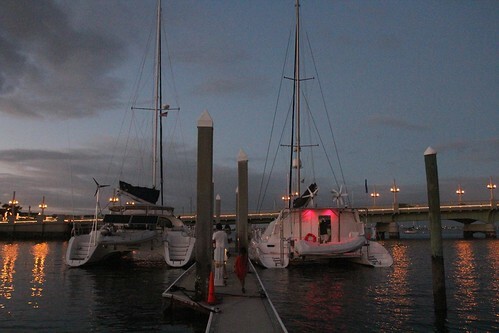 Kyle “just happened” to run into a couple he met in Charleston who owned a sweet 47 foot catamaran and they “just happened” to be docked at the marina near where we parked. This is sounding a little fishy to me. Then we were all invited on board and given tours. The lady of the ship was really working me on the pros of living aboard a boat. And this no longer sounded a little fishy… it sounded A LOT fishy. 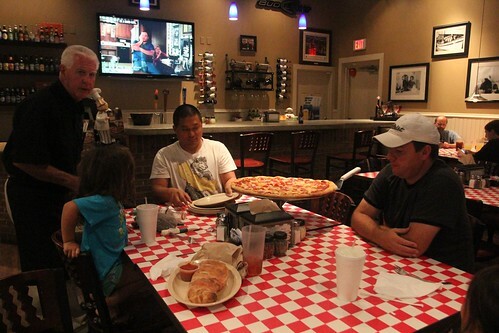 Since they didn’t sink every penny they owned on a boat today, we had a few bucks to go out for pizza to a place called Carmello’s Marketplace Pizza. It might have been attached to a gas station but it was damn good. 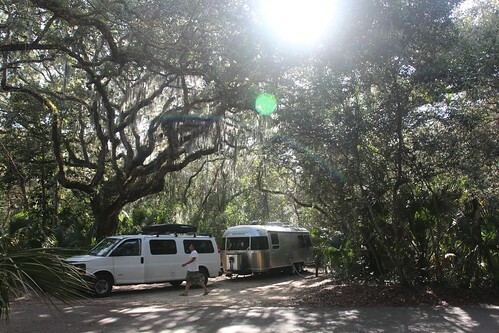 Day 121: Our mini Airstream rally in Huguenot. 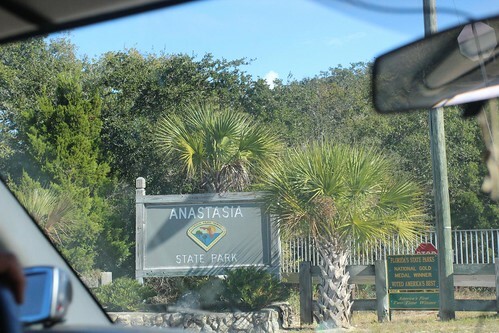 Day 123: Beach day at Anastasia State Park. 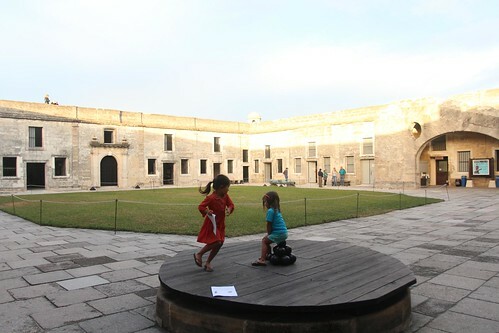 2 Responses to Day 122: Boats and Forts in Saint Augustine. Your girls are so fashionable! I don’t think I’ve seen them wear the same outfit twice in your pics. 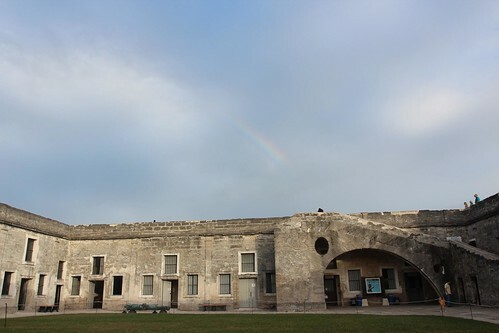 I used to live near Jax, and St. Augustine was one of my favorite places to go on a day off. 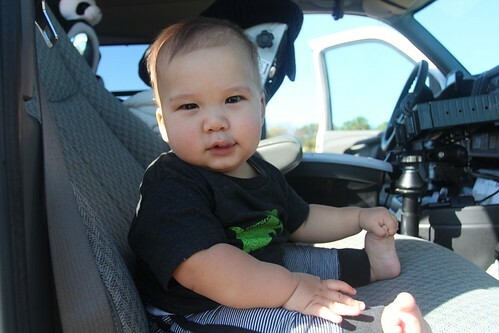 I knew when I saw your pics, even before I read your blog title, that you were in St. Augustine. It’s interesting how some visual memories stay with us for a long time. I remember driving by the Ripley’s Believe it or Not museum every time I drove in and out of town there.